Have you given much thought to how you talk to your friends? Are you rude, judgmental, short-tempered, sarcastic or hateful in any way when you speak to them? Or are you polite, kind, giving compliments or noticing of things that might be important to them? 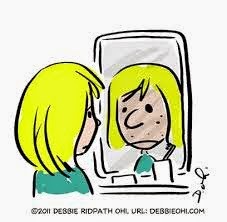 Now a really important question for you...how do you talk to your best friend...that person who looks back at you from the mirror? What's that you say...you aren't your best friend? How does it work when you can be friends with others but not with yourself? Personally, I don't think it can. I believe that before you can befriend another person, you must first befriend yourself. Starting right now, listen to what you say about yourself in your thoughts and out loud. What do you say about yourself when you speak to others? Are your words kind and caring or self-deprecating? Would you say to your friends the same words you say to yourself? If the answer is a resounding NO, then practice loving kindness to your best friend. Practice loving kindness to you.